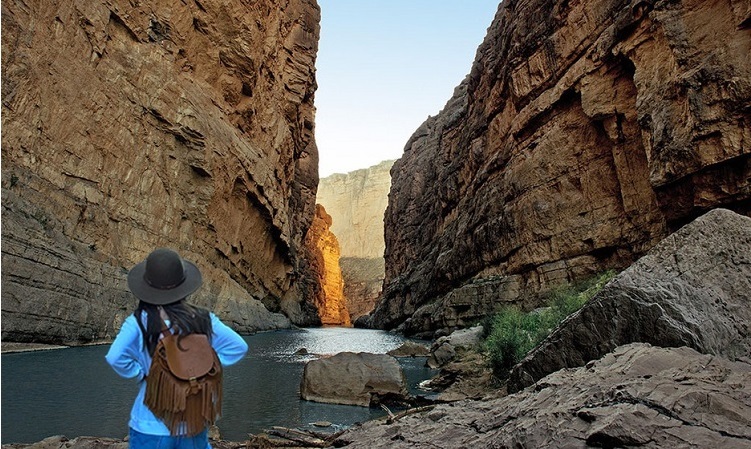 Big Bend National park is a hiker’s paradise containing the largest expanse of roadless public lands in Texas. More than 150 miles of trails offer opportunities for day hikes or backpacking trips. Elevations range from 1800 feet at the eastern end of Boquillas Canyon to 7,825 feet atop Emory Peak in the Chisos Mountains. These elevation changes produce an exceptional variety of plants, animals, and scenic vistas. Protect yourself from the sun. A hat and sunglasses are strongly recommended, as well as rain gear since weather conditions can change rapidly. Also wear long pants, and a long sleeved shirt. Always carry water. The dry desert air quickly uses up the body’s water reserves. We recommend that you carry a minimum of one gallon of water per person per day in the summer, slightly less in the winter. For half-day hikes, carry at least 2 quarts per person. Carry plenty of water and drink often, even if you don’t feel thirsty. Springs and tinajas (depressions in rock where water collects) are unreliable and may be unsafe to drink. Purify spring water before use. Springs are rare in the desert and wildlife depend on them. Travel as the animals do, in the morning or evening, rather than during the heat of the day. Wear appropriate clothing, good hiking boots, and a hat. Camp at least 100 yards from any trail, cliff edge, historical structure or water supply and 500 yards from any tinaja on the Mesa de Anguila. Stay on hiking trails. Don’t take shortcuts off trails or cut switchbacks. Don’t climb unstable rock. Most rock faces in the park are fragile. Don’t collect, harm, or kill snakes or other wildlife. They are protected. Don’t take your pet into the backcountry with you, regardless of your method of travel. Watch the weather. Even distant rain can cause flash floods where you are in the park. Wear old shoes in case the Terlingua Creek crossing is muddy. If the water here is deep and swift, do not cross. Once across the creek, the trail climbs a flight of concrete steps, then slopes gradually down to the river’s edge inside the canyon. This is one of the narrowest places in the 7-mile long Santa Elena Canyon. Keep your distance from all wildlife encountered during your hike. Any wildlife can be unpredictable. Keep a distance of at least 100 yards. Remember that all park resources – fossils, plants, animals, artifacts and rocks – are to remain as you find them. Each person is entitled to the same sense of discovery you experience when traveling the park trails. national park © 2019. All Rights Reserved.